This bike assembly station at Portland airport is a fantastic innovation and much needed in airports worldwide. A friend who recently brought their bike from Dublin to Chicago told me that the facilities in Dublin Airport are non-existent for cyclists. Bicycles must be boxed or bagged and passengers are advised to remove the front wheel and secure it to the frame, lower the handlebars and saddle and place in line with the frame and invert the pedals. However the airport does not offer passengers any facilites to box, bag or adjust your bicycle. Also getting to the airport proves to be difficult for cyclists. While they have put in some cycle lanes within the airport complex recently, once you get to the entrance roundabout, they vanish without a trace as the cyclist is faced by joining a daunting three lane motorway interchange. It is also worth noting that none of Dublin Bus's services to the airport accomodate cyclists, while Aircoach says on its website that, space permitting, it can accomodate bicycles. Needless to say Dublin Airport Authority do not even list 'By Bicycle' in their To & From the Airport section on their website. In it's recently published Dublin Airport Travel Plan, the DAA has stated that 'over 100 bicycle parking spaces have been provided for staff who choose the bicycle as their preferred option to travel to and from their workplace. When Terminal 2 opens in 2010 there will be an additional 100 spaces provided'. However according to staff mobility surveys just 2% of workers in the airport motorbike/cycle to work and this figure has remained constant since 2001. They hope to raise this figure to 3% by 2012. Wow, 3%, ambitious targets guys...and that includes motorbikes! The total workforce in the airport is about 13,000. Dedicated Showers for cyclists will be provided over the next 12 months in the Terminal building'. Believe it or not people do actually cycle to and from the airport and they should also by provided for, not just for workers in the airport complex. Cue, Portland airport Oregon. 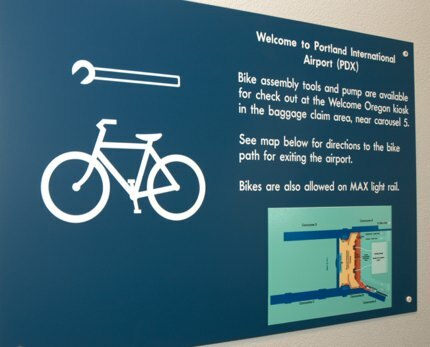 Modeled on bike assembly areas at airports in New Zealand and British Columbia, Portland airport offers a work stand with two clamps, basic tools and maps and other literature about biking in the region. While the facilities are open 24/7, the tools are available from the desk between the hours of 08:0 - 22:00.